If you look at the Soul Clock label you see superb soft soul from the Whispers certainly, but also harder material from the likes of Vernon Garrett, Sugar Pie de Santo and the Fuller Brothers as well. But this one-off has not received any attention at all and that is a shame as it’s worth much more than a cursory listen. Connie is a confident singer, able to get her song of hurtful infidelity across with no little skill, helped by the male group the L Trays, and a sympathetic arrangement. Lovely downward chord changes too. 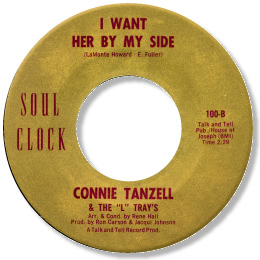 The song’s title makes no sense – and bears no relationship to the words that Connie is singing. But this is a minor quibble – this is a fine 45.